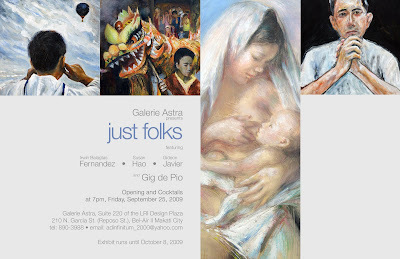 IF you're not doing anything between Sept. 25 and Oct. 8, I suggest you drop by Galerie Astra at the LRI Design Plaza along Reposo St. in Makati and browse through the works of four new artists, among whom is my friend, the madcap evil genius and anti-basura revolutionary Gideon Javier. Irwin works for a software company that provides information services and technology for financial markets. Painting serves as a respite from his structured working environment. His influences are graphic novel artists, classical and contemporary figurative artists; both foreign and local. He strives to harness the discipline of fine art, under the guidance of Mr. Gig de Pio, in channeling these influences and personal nuances when drawing or painting. This otherwise daunting experience continues to be fulfilling and fruitful. For this, he is very thankful to Mr. de Pio. Susan, a Filipino-Chinese, has been a licensed agent and trader to various brokerage firms since 1988. She is presently with Accord Capital Equities Corporation. Without prior experience in drawing or painting, Susan enrolled herself at the Ayala Museum art workshops. For this stockbroker, she will forever be grateful to her mentor Mr. Gig de Pio, because without his guidance and patience there may never have been a Susan Hao - the artist. Gideon Javier is the principal of an interior design and construction firm. He has been a frustrated artist since childhood when he was forced to turn down an apprenticeship by a family move from Cambridge, Massachusetts to Los Angeles, California. In 2005, his wife enrolled him in an art course at the Ayala Museum which led to an apprenticeship under Gig DePio. Gideon shies away from realism one side and abstract on the other, looking instead to capture the moment in a few strokes. In a previous century he would have called this impressionist. He is grateful to Gig for allowing his to stray down this path. Born October 22, 1951 in Balamban, Cebu, Gig Mario Completo de Pio - a former professor at the University for the Philippines College of Fine Arts in Diliman - taught Materials & Techniques of the Old Masters, Anatomy, Figure Drawing & Painting from Life. His oeuvre based on his study on entropy - " the ultimate law of nature" - is a testimony to its natural consequences in art and its uses in the creative process. " With gestalt perception, there can be order in chaos viewed from without, not from within a system". From scratches and smudges on canvas or paper can emerge the magical flutter and flurry of a masterpiece. Gig de Pio has a gift of capturing not only the likeness but also the presence of a sitter deftly from life. He is one of the very few master portraitists in the country today.